Chairman, CEO and President Kevin P. Conlin, center, is joined by Rutgers Director of Athletics Pat Hobbs, left, and Rutgers Football Coach Chris Ash, right, in announcing a new community partnership between the two New Jersey-proud organizations. 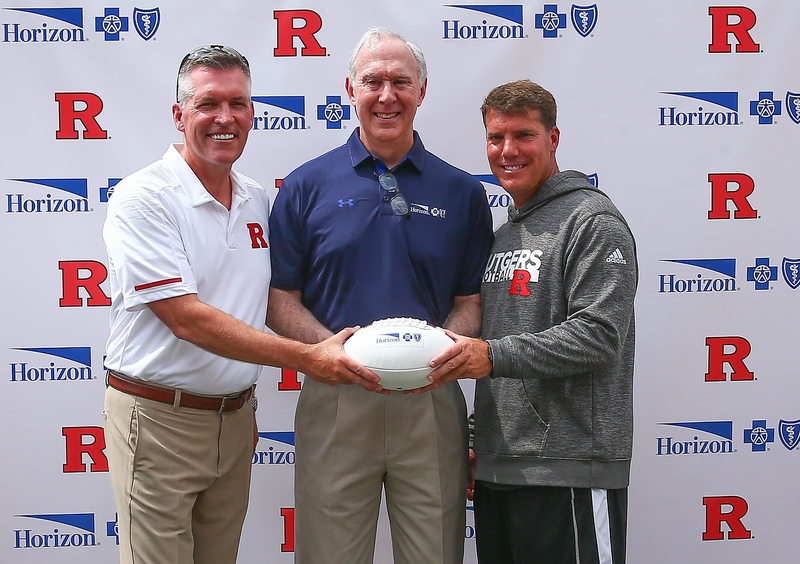 Through this community partnership, Rutgers Athletics and Horizon BCBSNJ will seek to use their collective reach, popularity and influence to positively affect New Jersey families. The partnership, which builds on an existing relationship, seeks to improve the health and quality of life in New Jersey and brings a strong focus to promote healthier lifestyles through education, awareness and by motivating fans to take action. Conlin, a 1980 Rutgers college graduate and former Scarlet Knight football player, noted that Rutgers University and Horizon BCBSNJ already enjoy a joint medical research partnership, a collaborative with the Rutgers Pharmacy School, common philanthropic investments, and academic connections in which many Horizon BCBSNJ leaders serve as guest lecturers or professors in university classrooms. Game-day wellness activities at the new Horizon BCBSNJ Fan Corner -- Located in the southeast corner of the football stadium, it will provide light health screenings, health education and wellness activities, and special opportunities to meet Rutgers Football Alumni players. Healthy food options on game-day -- Horizon Healthy Huddle will offer fans a healthy twist on stadium fare at two concourse concession stands, featuring a nutritional menu co-developed by Horizon and Rutgers food and nutrition experts. The healthy concession will also operate at the Rutgers Athletic Center (RAC) for basketball and other sports activities. Supporting New Jersey’s youth -- Horizon BCBSNJ and Rutgers Athletics student athletes will visit schools and nonprofit organizations throughout the state to promote health and wellness initiatives. Horizon BCBSNJ and Rutgers Athletics will provide local youth community organizations with tickets and unique experiences at select games. Rutgers Athletics and Horizon BCBSNJ collaboration on several health and wellness initiatives, including the R Fit program. Co-branded messaging at games serving the New Brunswick, Newark and Camden campuses to further advance our community outreach to promote health awareness and education. Special benefits for Horizon members and employees. The relationship with Horizon BCBSNJ was facilitated by IMG, the exclusive multimedia rights holder of Rutgers Athletics.